Once I switched all of my skin care products to non toxic products, it was a huge challenge. I used the same brands of cleansers and moisturizers for years. So, I had zero idea where to start. I began doing a lot of research, and looking for brands that were the most reputbale in the non toxic skin care industry. Thankfully, I hit the jackpot, and am happier now than I have ever been with my skin care routine! Read below for all of my favorites right now. One of the first non toxic products I tried was this face mask. Boy did it set the bar high! I have been getting facials done for YEARS, and this product immediately made my face feel so clean. You know how after you get a facial you realize how dirty your face must have been because it feels SO clean now? Well this mask saves the day between facials. It cleans out my blackheads so well and gives my face a super brightening look! My pores have reduced drastically since I started using it. I recommend using it 1-2 times a week. Epicuren products are so good. They seriously provide the best results on my face. 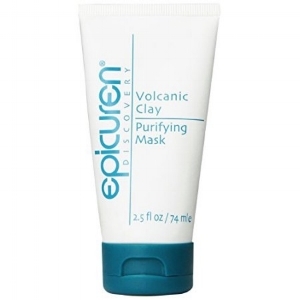 I use this product on my T-zone, because I get super oily and have crazy blackheads. This really cleans them out and reduces the size of my pores. You will not be disappointed with the results of this product. This brand is spectacular. I've ALWAYS suffered from dark under eye circles. When I say dark, I mean every morning it looks like some one punches me in the eyes. Some of its hereditary, but some of it is also thyroid related. Another lovely hereditary feature I have is saggy eyelids. My aunt, uncle and mom all have eyelids that legit sag. I know there's a term for it, but I’ve honestly never looked it up.So in my mid 20's, I started noticing that the “creases” on my eyelids were getting way out of hand. When I put on eye shadow it was never straight and itlooked like amess because my eyelids were so droopy. You could never see my crease color because my eyelids drooped over it. I was so distraught thinking that I was cursed with the heavy eyelids in my mid 20's! I didn’t think I would be plagued with that until at least 40! So, I started using this product about 4 months ago. Let me tell you something. There is ZERO sagging on my lids now. It is completely tight. One day I was doing my usual paint by numbers on my eyelids and I noticed that my lids were completely tight and there was nothing drooping or hanging anywhere where it shouldn’t be. I absolutely SWEAR by this product. Also, It doesn’t look like I was mugged in my sleep anymore with my dark circles. I mean they haven’t completely gone away, but I would say they went from a midnight black to a light grey. Hey, Ill take it! This serum is so smooth and lightweight. I put it on before bed and the next day I could tell a difference. I dread when people say that. Because it's been ONE night do you seriously see results that quick? Yes. The answer is yes. My skin was so bright when I woke up and felt incredible. The next day I went and purchased the whole bottle and also ordered the moisturizer and the eye roller. When they shipped it to me, they shipped me the 4 oz instead of the 2 oz as an upgrade. How freaking sweet is that? I basically swear by about 4 of his products, but ill tell you more about those in another blog post. I may send this man a Christmas gift I am that obsessed with his products! This stuff is incredible. I'll never neglect my heels between pedicures ever again. It comes with a fan brush that you literally just glaze the honey mixture on your heels. It wasn’t sticky at all and it absorbed right into my skin. In fact, I put my socks on right after. I have noticed a big difference at how soft my heels are. Plus just the feel of this glaze makes it all worth it. Pamper those heels ladies. I have always had oily skin. As I’ve gotten older though, my face has started to dry out, which really bugs me out. I started using this face oil, and it is life changing. I use it to remove all of my makeup at night, and it leaves my skin SO soft. I was fully expecting my face to start breaking out after using this product, but it has actually done the complete opposite. My face looks better than ever, and my wrinkles around my eyes are starting to reduce! Let me know how these products work for you! I would love to hear your reviews!